Shake with ice and strain into a cocktail glass; I added a lemon twist. Two Saturdays ago, I considered the history of the French 75 that I had read in a Difford's Guide article. Before the drink landed on the gin (or Cognac), lemon, sugar, and Champagne number, the World War I-era French 75mm field artillery gun, it had a few non-carbonated precursors. 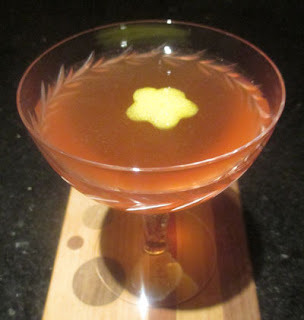 The earliest was the Soixante-Quinze created at Harry's Bar that made a 1915 newspaper article and later appeared as the "75" Cocktail in Robert Vermeire's 1922 Cocktails: How to Mix Them book as above (with different proportions as the 1915 recipe). It was not until Judge Jr.'s 1927 Here's How book during Prohibition that sparkling wine was penned down on paper. While Judge pointed out that if you build the recipe with club soda instead, the mix becomes a Tom Collins, the literature makes me doubt the history that the libation began as a Tom Collins when British soldiers were trying to make do with what they could scrounge up. Vermeire's recipe provided the history of, "This cocktail was very well appreciated in Paris during the war. It has been called after the famous light French field gun, and was introduced by Henry [Tépé] of Henry's Bar fame in Paris." Overall, the combination was akin to a Pink Lady sans egg white and thus reminiscent of a Jack Rose as well as the Blue Skies (a drink I was served at a local bar that was perhaps culled from the literature). In the glass, the "75" Cocktail proffered a lemon, apple, and berry nose that led into a crisp berry sip. Next, apple and the gin's juniper and other botanical notes joined forces on the swallow.